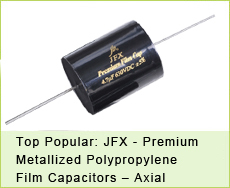 Do you know jb produce different series for Axial Aluminum electrolytic capacitors? We have Low Leakage series, standard series, and for Audio System series. While, for special parameter can be checked as well. Surely, we can meet all your application demands. We support very good price, high quality & fast delivery time. Please don’t hesitate to contact us if you have any request on hand. 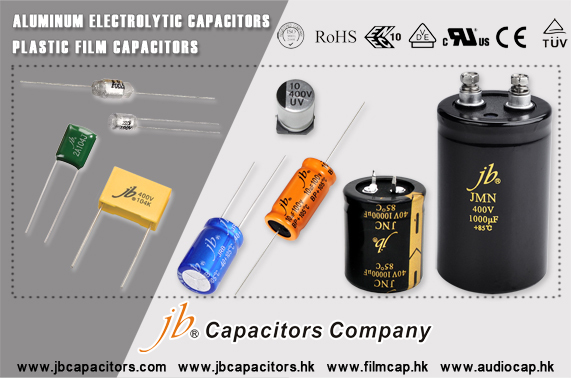 If you look for other Film capacitors or Aluminum electrolytic capacitors, welcome also contact us, we will do best for you as usual. As you know, we are going to discontinue our JFV series in 2019. But don’t worry about it. We still have strong X2 series, JFW. JFW is our hot item. 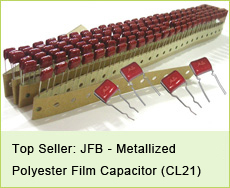 We provide it with competitive price and fast lead time. For some common value, we even can ship out the goods within 4 weeks. We have lots of size with certification now. Would you like to let me know your demand? Then I can arrange some samples for you. 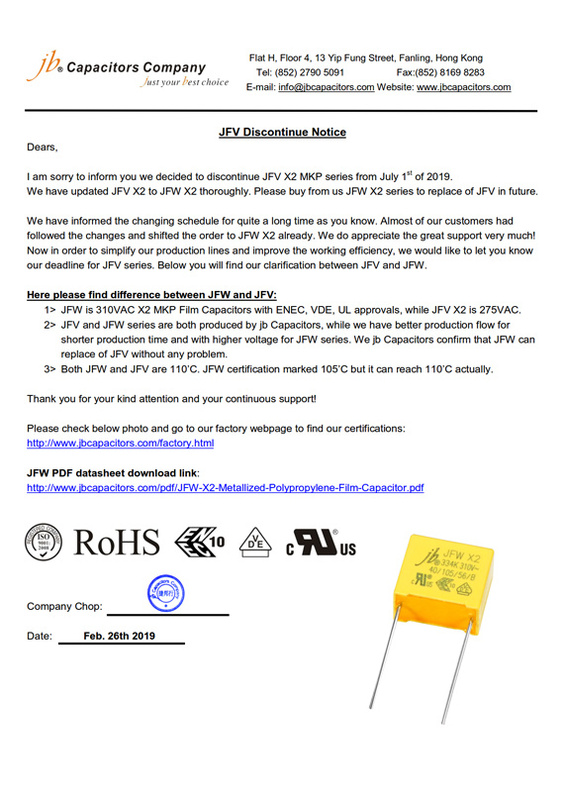 I am sorry to inform you we decided to discontinue JFV X2 MKP series from July 1st of 2019. We have updated JFV X2 to JFW X2 thoroughly. 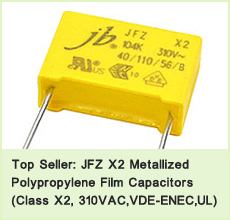 Please buy from us JFW X2 series to replace of JFV in future. We have informed the changing schedule for quite a long time as you know. Almost of our customers had followed the changes and shifted the order to JFW X2 already. We do appreciate the great support very much! Now in order to simplify our production lines and improve the working efficiency, we would like to let you know our deadline for JFV series. 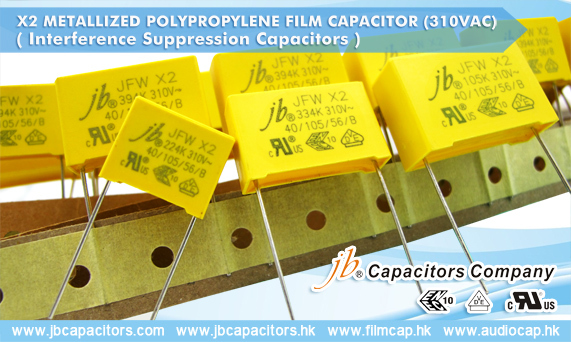 1> JFW is 310VAC X2 MKP Film Capacitors with ENEC, VDE, UL approvals, while JFV X2 is 275VAC. 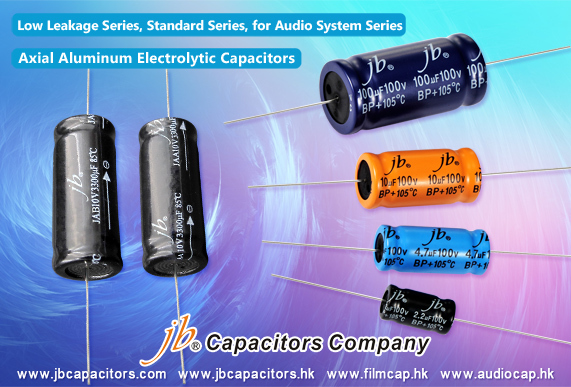 2> JFV and JFW series are both produced by jb Capacitors, while we have better production flow for shorter production time and with higher voltage for JFW series. 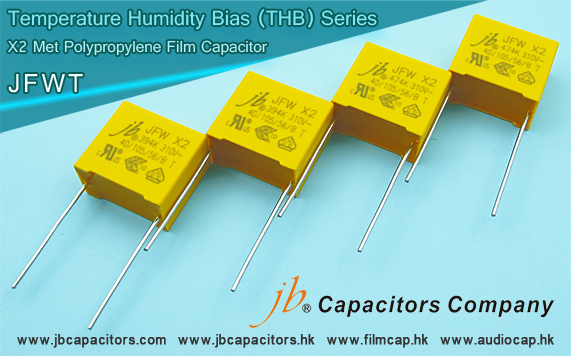 We jb Capacitors confirm that JFW can replace of JFV without any problem. 3> Both JFW and JFV are 110’C. JFW certification marked 105’C but it can reach 110’C actually. Thank you for your kind attention and your continuous support! Hello, please see our new web page for exhibitions history. We exhibited many famous exhibitions these years. We are looking forward to meet with you face to face in the next exhibitions! Please follow us on below channel, thank you very much. 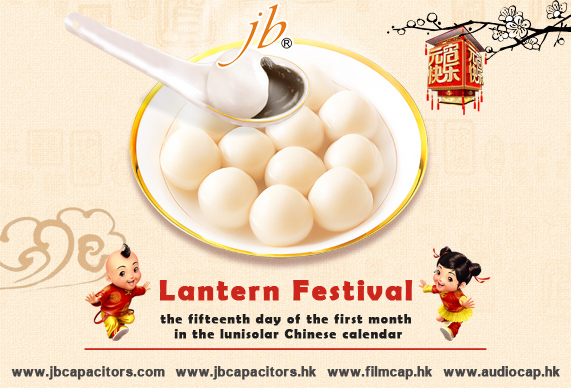 After Chinese Spring Festival, Lantern Festival is coming! During the Lantern Festival, children go out at night carrying paper lanterns and solve riddles on the lanterns, and there will be very wonderful Lantern party in the park. We wish all our customers and friends a happy Lantern Festival, wish the lanterns bring you more happiness, and hope our business will increase much in new year. 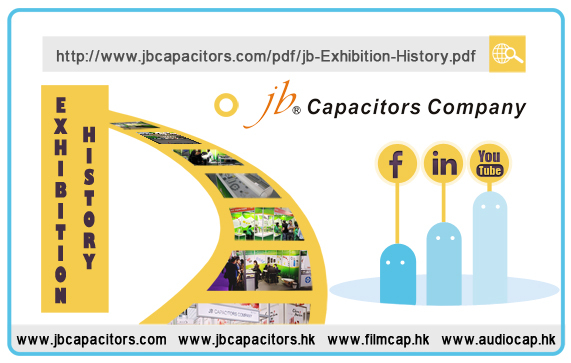 jb’s conductive polymer aluminum solid electrolytic capacitors surface mount is designed for greater stability and longer life. They are common on graphics cards and placed on the board by machine before the board goes into the solder bath in the wave solder machine. 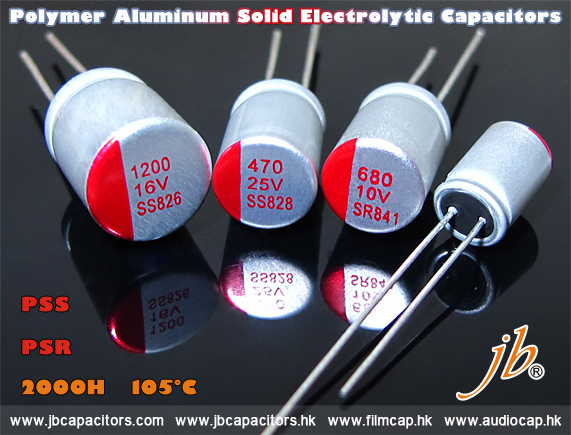 Polymer aluminum solid electrolytic capacitors utilize aluminum and a high conductivity polymer material to offer low ESR, excellent noise reduction and ripple current. 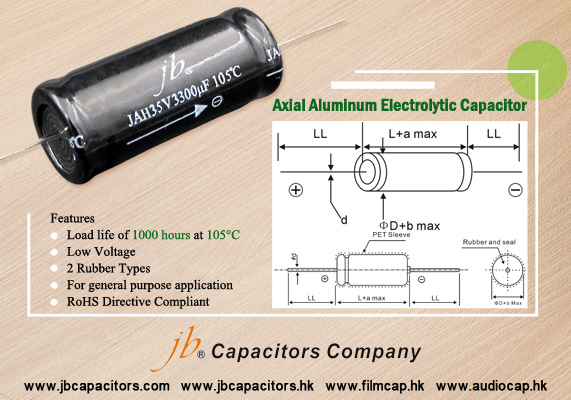 The surface mount form factor conductive polymer aluminum solid electrolytic is ideally suited for industrial and commercial applications. Typical applications include mobile phone chargers, computer motherboards, servers and consumer electronics. Address: Sao Paulo Expo, Sao Paulo, Brazil.